This feature rich virtual printer allows you to Print to PDF creating fully compatible, text searchable PDF files. Includes the Microsoft Office Toolbar Add-in and Office2PDF batch conversion utility. Also included in PDF-XChange Pro bundle. If the answer to any of these questions is yes then this is the product for you. Tracker Software’s best-selling virtual printer, PDF-XChange Standard, is the ultimate application for the creation and virtual printing of industry-standard PDF files. It’s compatible with files from almost all Windows applications, such as Word, Excel and AutoCAD, and features an optimized hybrid conversion engine that prints to both GDI and XPS. The files it creates are surprisingly small, given their quality – allowing for faster uploads/downloads, a reduction in storage space and increased data retention. PDF-XChange Standard also features MS Office integration, which provides extra functionality such as adding clickable tables of contents and embedded URL support that facilitates the creation of external links. Batch conversion is also supported, making it possible to convert multiple MS Office files simultaneously into PDF documents. Virtual printers generate fully-compatible, industry-standard, native PDF files (as opposed to paper versions of documents). When suitable source material is used these documents feature searchable text, which greatly increases the efficiency of searching, selecting and editing files. PDF-XChange Standard features a wide range of functionality and customizable options to enhance, update and secure PDF files - please see below for an extensive list. Our support team endeavor to respond to all queries within eight working hours – and we are usually much faster. We are available via email at support@tracker-software.com. Alternatively, browse our free support forums for the answers to your questions. Please note that if it is intended to incorporate and/or distribute this software with other software for commercial profit then you must first gain permission from Tracker Software. PDF-XChange Standard has been re-engineered and now features a faster, highly optimized hybrid conversion engine that prints to both GDI and XPS. Driver Mode Rules have been introduced, which enable the designation of GPI or XPS printing for user-specified printing applications as desired. Use Watermarks, Auto Bookmark Generation, Headers and Footers and Link Settings to update PDF files. Edit document information - including the option to add XMP Metadata. Create new files from Windows applications, create Interactive Adobe AcroForms, append and/or prepend PDF files with pages from other documents and enjoy complete control over the PDF creation properties. Use comprehensive Digital Signature and Security Settings, including 40/128 bit RC4 and 128/256 bit AES Encryption options, to secure PDF flies. Password protection and permission options are also available. PDF-XChange Standard is compatible with Citrix Metaframe/Terminal Server but users should note that we do not support XennApp at this time. Specifically, the printer drivers are not designed to work in a virtualized environment. Avail of flexible output options, utilize batch conversion to convert multiple files simultanesouly, create Watched Directories to enable the automatic conversion to PDF of MS Office documents moved to specific folders, and much more - see below for an extensive list of available features and functionality. PDF-XChange Standard now supports Mixed Raster Content, which significantly improves the compression quality of images that contain both binary-compressible text and continuous-tone components. Create user profiles, determine UI language, set font and downsampling options, paper settings, custom form options, optimization, compression, resolution and scaling settings. Use the Profiles feature to save personalized settings for subsequent use. Use digital signatures to sign and secure PDF files. PDF-XChange Standard installs its toolbar automatically and creates a tab in MS Office programs on your computer. This enables a quick and convenient method to access the functionality of PDF-XChange Standard and convert MS Office files to PDF format. Batch convert MS Office and HTML files with the Office2PDF feature. Additionally, use the Watched Directories feature to have MS Office files that are saved in specified directories automatically converted into PDF. Use the n-UP Printing Mode to rescale and place multiple pages on each printed sheet. Alternatively, use the enhanced visual layout previewer to resize pages via the preferences options. Feel the difference: our latest build features improved image/image text character conversion that our reengineered and optimized conversion engine makes possible. We have also introduced support for several additional PDF/A formats, which makes long-term archiving possible whilst maintaining high levels of quality. Use the Booklet layout to print booklets and similar documents. Customize sheet size, sheets in signature and gutter size options as desired. Avail of predefined options such as the Brochure layout and the Book option, which features double-sided printing. 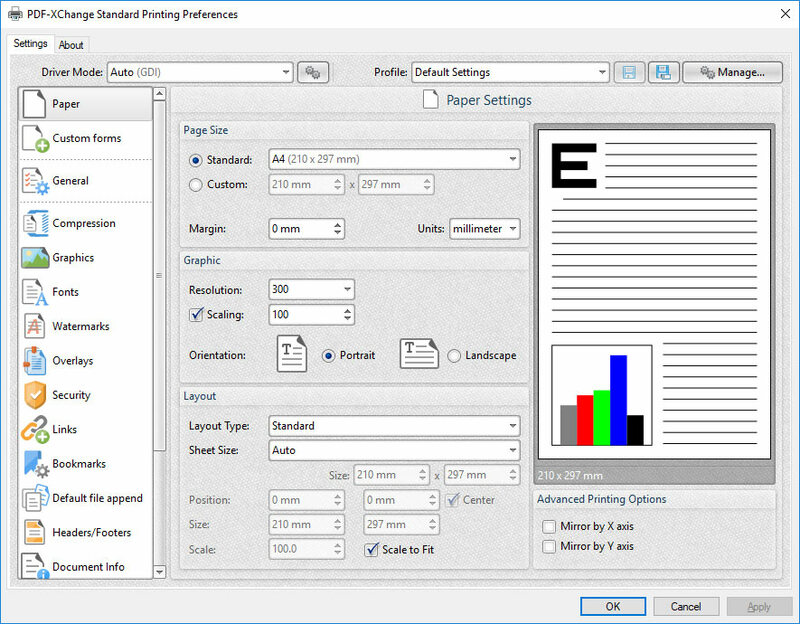 Use the Paper settings to determine the Page Size, Graphics and Layout settings for printed documents. Use default or custom page sizes. Set document margins, resolution, scaling and orientation options as desired. Select from a range of layout options, including the Booklet and Multiple Pages Per Sheet setups, and utilize mirrored printing as desired. Use the Custom Forms settings to save/edit/delete customized forms for printing. Use the General settings to determine document parameters such as conformance, PDF-specification, content layout, display options, full-screen settings and the preferences of the viewer used to view the document. Use the Compression settings to determine compression options for graphics and text in printed documents. Set compression options for high color/grayscale images, indexed images and monochrome images as desired. Use the Graphics settings to determine the resolution (DPI) for document images, or convert them into different image formats. Avail of Linear, Bilinear or Bicubic downsamplling options, and set conversion options as desired. Use default settings to print in Brochure or Booklet mode. Mirrored Printing is also supported. Use the Fonts settings to determine font-embedding options for printed documents. Embed all used fonts, protected fonts, extended font/character into and/or font subsets as desired, and select which fonts are always/never embedded. Use the Watermarks settings to create watermarks and add them to printed documents. 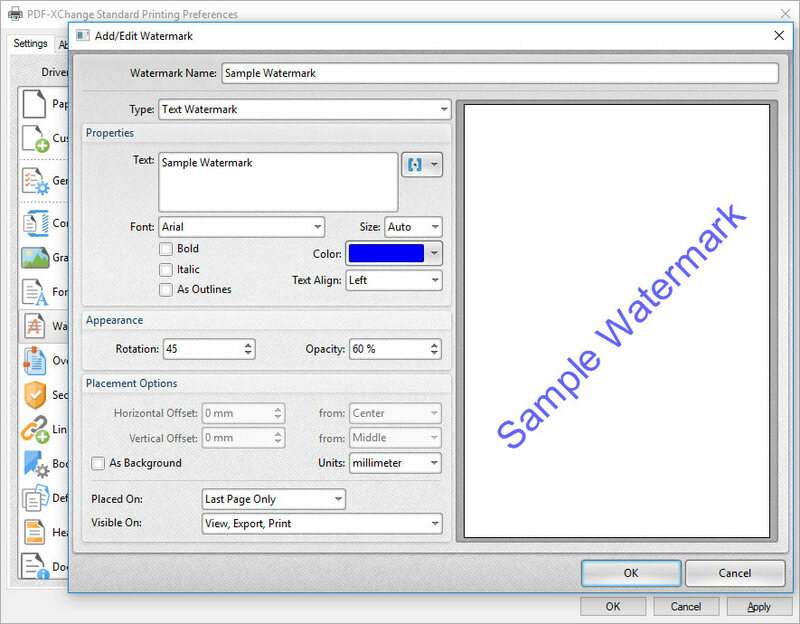 Create customized image/text watermawks and determine their display/visibility options as desired. Use the Overlays settings to overlay printed documents. These settings enable the insertion of content such as company letterhead into documents. Overlays can be used in conjunction with pre-prepared forms to overlay text from word processors, spreadsheets, databases and similar media. 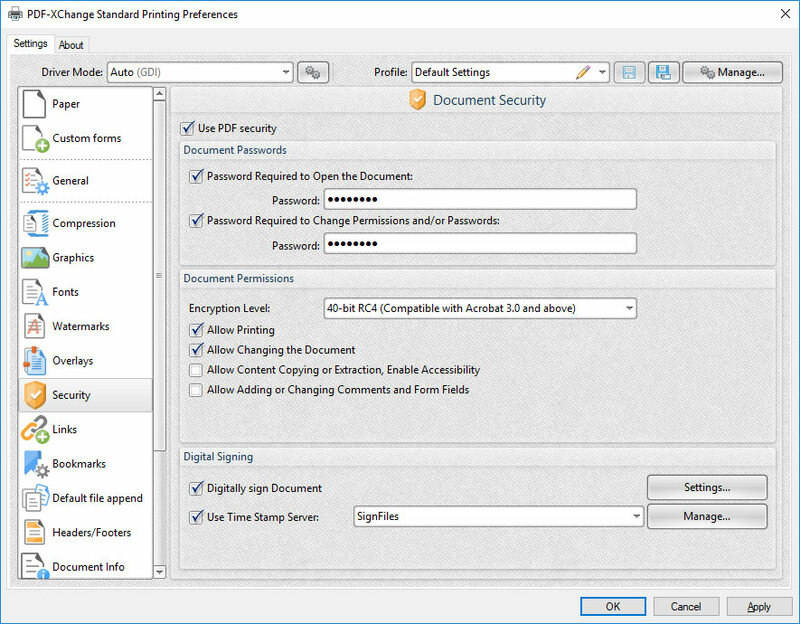 Use the Security settings to determine security settings for printed documents. Set passwords and editing permission settings, and sign documents digitally as desired. Use the Links settings to determine parameters for URLs and other links in printed documents. PDF-XChange Standard contains functionality to detect filenames and convert them to links in printed documents, as well as to ensure that linked documents exist. The appearance of links can be fully-customized as desired. Options for both literal and embedded links are available. It is also possible to convert MSOffice Tables of Contents (TOCs) into links. Use the Bookmarks settings to determine bookmark parameters in printed documents. Set options for multi-line bookmarks, bookmark roots and the manner in which bookmarks display and are categorized. Use the Default File Append settings to append/prepend an existing file to printed documents. 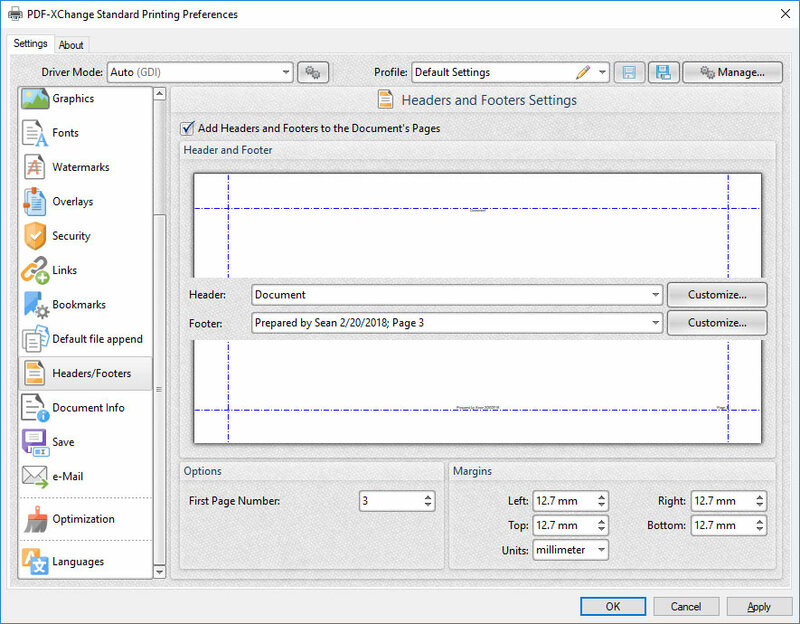 Use the Headers/Footers settings to add headers and footers to printed documents. Avail of a range of customizable style and layout options. Use the Document Into settings to determine PDF information in printed documents. Add XMP Metadata such as the Title, Subject, Author and Keywords to printed documents. Use the Save settings to determine the method through which PDF-XChange Standard names and saves files. Select from a range of printing job management options and customizable settings that are used when files are saved. Use the MAPI/SMTP automated Email settings to email printed documents as email attachments directly from PDF-XChange Standard. 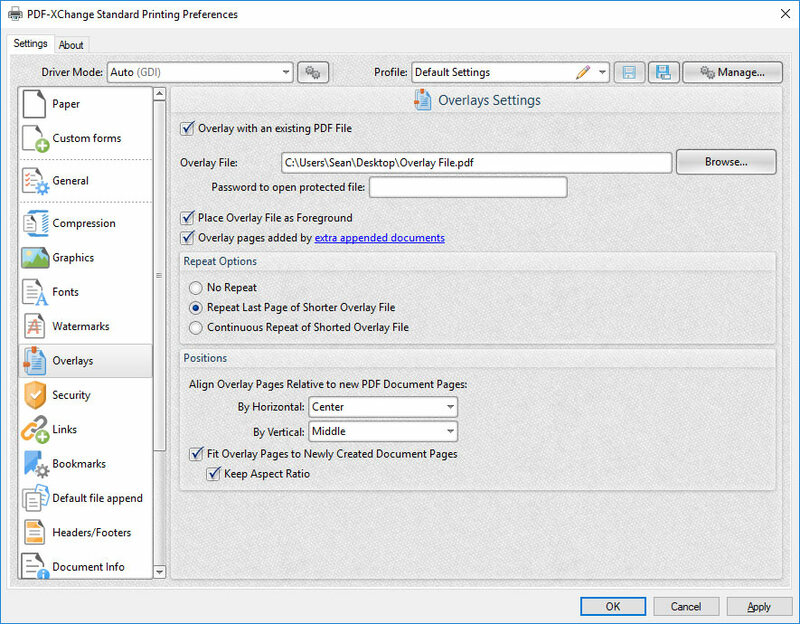 Use the Optimization settings to optimize printed documents. Set blending options and de-tesselation methods for documents, and avail of additional settings such as the use of transparency drawing, masked images, optimization of image sequences and swapping to disk of images above a user-defined threshold. Use the Languages settings to determine the language of the user interface in PDF-XChange Standard. Use the Toolbar Add-In and MSWord 2003 to convert MS Web forms and create interactive Adobe Acroforms. Revision 6 of Acrobat X® password security handler is supported. Create PDF files from the output of all Windows applications. PDF-XChange Standard is Citrix Metaframe/Terminal Server certified. PDF-XChange Standard supports CJK fonts and character sets. PDF-XChange Standard enables users to print almost all industry-standard formats, including documents created in MS Office and AutoCAD, to fully-compatible and text-searchable PDF files. PDF-XChange Standard V7 comes fully equipped with a Microsoft Office Toolbar Add-in and Office2PDF batch-conversion utility. Please note that this product is included in PDF-XChange Pro bundle. PDF-XChange Standard enables the creation of numerous PDF format specifications, such as PDF/A-1, PDF/A-2, PDF/A-3, as well as providing full control of document parameters such as the initial view, zoom level, start page, display options and many more. PDF-XChange Standard gives users complete control over compression settings, which enables the optimization of space usage and signficant reductions in file size. PDF-XChange Standard can be used to greatly enhance the security of documents. Add document encryption, password protection and/or digital signatures when documents are created. PDF-XChange Standard features watermark functionality that can be used to add fully-customizable text or image-based watermarks to created documents. PDF-XChange Standard includes an overlay insertion feature that can be used to add company letterhead and similar document elements into print jobs - enabling the efficient creation of fully customized and professional PDF documents. PDF-XChange Standard can be used to add a wide range of customizable headers and footers to PDF documents. PDF-XChange Standard is available in an 32/64 bit .EXE installer only. I am new to this program, but I am very impressed with it. I recieve a lot of pdf files which I need to change before I send them on. With this program I add drawings, text and notes. I also use it to blank out detail that I want to hide from the next user. It would be even better if I can change the scale for the measurements. Then I would be able to use this programs to calculate accurate areas.